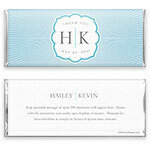 Add a note of noble elegance to your special celebration with this timeless and lovely monogram candy wrapper design. Design: Striped rays with a decorative frame and bold initials. Personalization: Front message, date and initials with back title and message.